We are once again sitting right in the middle of that beautiful time period when updated jailbreaking tools are available, which allow us to free our iOS devices from their technical shackles. For those who have been sitting with an iPhone, iPod touch or iPad running Apple’s iOS 5.1.1 firmware, you will no doubt be aware that after weeks of hard work and research, Pod2g and his team have released an untethered jailbreak for all existing iOS devices, excluding the third-generation Apple TV. As a part of that hard work, the Chronic Dev Team have provided the necessary updates to their Absinthe tool, which was originally released back in January, and was the tool behind jailbreaking the iPhone 4S and the iPad 2 (on iOS 5.x) for the first time. Absinthe is an extremely simple GUI tool which allows users to inject the necessary files into their device so that they can benefit from the untethered jailbreak. If you happen to be sitting with an iOS 5.1.1 device in your hand, then read on for full details on how to use the Absinthe app to achieve an untether. Make a complete backup of your device using iTunes or iCloud before jailbreaking your device. If your iPhone relies on an unlock, do not update to stock iOS 5.1.1 firmware and for the time being stay away from Absinthe. If you have a passcode set on your device, make sure you disable it before following the instructions below. Step 1: Download Absinthe 2.0 from here. Step 2: Once the tool has been downloaded, find the compressed file and extract all of the contents like you would with any standard zip file. Place the files on your desktop for easy and quick access. Step 3: Using a standard 30-pin connector cable, connect the device to be jailbroken with your computer. Step 4: Launch the Absinthe tool through the executable file which you downloaded in step 1. When launched, the program will show an initial interface that will have some text-based information on it, and a “Jailbreak” button. Step 5: If the device is connected properly as per step 3 then the Jailbreak button should be available. Press the button to begin the jailbreak process. 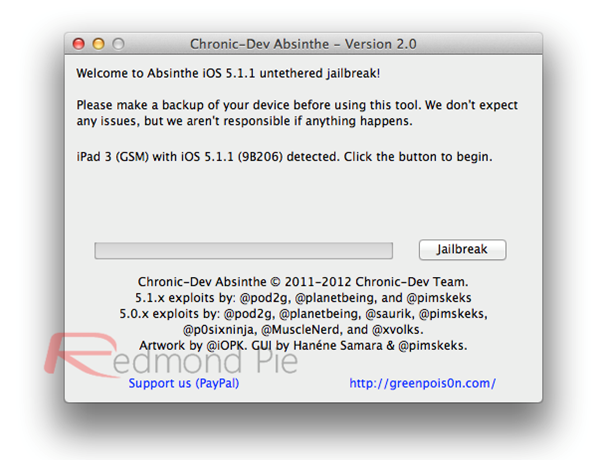 The initial Absinthe tool for iOS 5.0.1 accompanied with it a new method for jailbreaking iOS devices, so with that in mind, don’t be alarmed if the device looks like if it is going through a restore process. The progress bar on the Absinthe GUI will provide user feedback, please don’t touch the device at this time. Step 6: When the payload process is complete and you’re confronted with your device’s lock screen, the ever familiar Cydia icon will be present on the home screen. The device is now successfully jailbroken untethered and you can now install any extensions or packages via Cydia, provided that your device is supported by them. One of the great things about Absinthe and something which users – and us – love is the simplicity of the tool. Although the production and implementation of a jailbreak is extremely difficult and requires a very unique skill set, the dev teams have managed to produce a tool that is extremely user-friendly and simple to use. Hi, trying to JB my Ipad-1, with ios 5.1.1 but the JB program, Absinthe-win, kept stalling, saying some program stopped it. What do I do next? thank you. I have the same issue. Did you solve this? I own an Apple 6 unit is not shown here as to which one I should use to Jailbreak my iPhone.